Aztec Idols, an Aztec-themed slot released by PlayNGo, features an attractive theme and two bonus rounds. In addition to a top fixed jackpot of 5,000 coins, players can win up to x150 in one of the bonus rounds. Aztec Idols slot comes with 15 paylines and players have to first select the number of paylines they would like to play. The coin values range from $0.01 to $0.25. To play this slot, players have to first place a bet and then hit the Spin button to set the reels spinning. If the reels display a winning combination at the end of one spin of the reels, players will get a payout according to the game’s payout structure. To win the top fixed jackpot of 5000 coins or 5000 times players’ bet amounts, players need to spin a combination of five Riche Wilde icons along an active payline. PlayNGo’s Aztec Idols may remind players of Gonzo’s Quest. Although the themes are similar, the game stands in a class of its own. Beautifully designed, this slot presents a visual treat. It features three-dimensional graphics and plenty of innovative features. Aztec Idols revolves around the adventures of Riche Wilde and the reels are set against the backdrop of tombs, jungles, and hidden treasures. They feature icons related to the Aztec world, such as Aztec Temples, strange tombs, and relics. There are also a few beautifully decorated high value card symbols along the reels. Aztec Idols is famous for its two bonus games, the first of which is activated by the appearance of a combination of three Wheel symbols across the reels. The Wheel symbol then expands in size to reveal the number of free spins and an extra scatter symbol that appears during the free games. Players can win as many as 50 free games in this round. If players get two scatter Wheel symbols when a winning combination is created, the scatter symbols will expand all over the reels to activate new wins. The second bonus game is activated by the appearance of three Aztec Temple symbols. Players will then be taken to a screen that displays tombs with hidden treasures. Players need to click on tombs to reveal their prizes, but the game will come to an end if they click on an empty tomb. Players can win as many as 150 coins in this feature. In addition, the slot comes with a wild symbol in the form of Riche Wilde, which helps players spin winning combinations. The wild symbol, however, does not substitute for the bonus symbols. 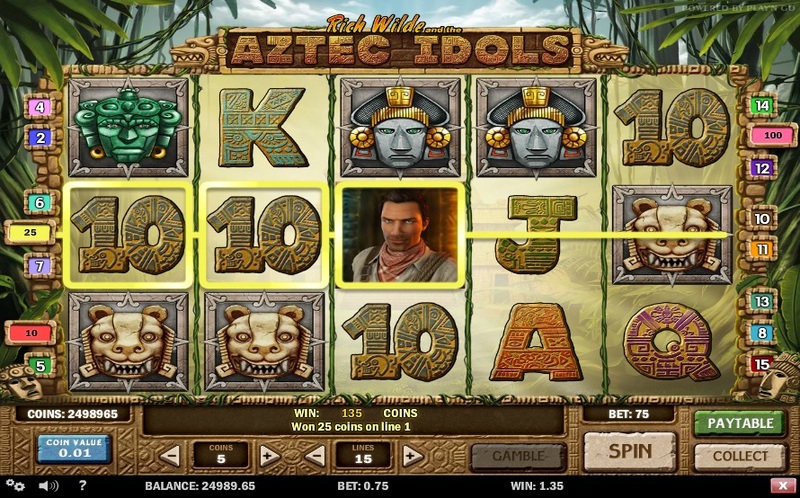 Aztec Idols is a slot that simply cannot be missed because of its charming theme and lucrative features. Interested players can spin the reels of Aztec Idols at any online casino that offers PlayNGo games.